In series one, the plucky American adventuress and the somewhat more retiring engineer faced danger from both human and alien life as they became ever more entangled in the politics of Victorian space travel and the rival claims laid by England and Germany over newly reached planets. There was also time for some soul-searching, as, with a nod to a decidedly modern audience, Annabelle lost a leg (gaining a fancy mechanical one), remaining emotionally scarred by the experience, and Nathaniel, although in a subtle, gentle sense, is brought to face the reality of emotions (as a man, dammit!) and the somewhat uncomfortable suggestion that he leans towards a different sexuality from the accepted norm of his era. Such personal examinations being tropes explored more in fiction of the twentieth century and beyond, the series wears its modernity on its sleeve, while never sinking into a morass of angst; ramping up the action to a pleasing degree as a counter-balance. This is the first story from series two that I have read, and it drops one part way through the series. So I think it is quite right to judge it as I read it. That is; how is it as a steam-punk adventure? And how is it as a story into which one may plunge? To take the latter first, this is a series going to great pains to develop a consistent, developing universe. Reading previous stories is very helpful in establishing facts, movements and characters. Indeed, while there is some explanation of previous events and people, for the most part these are mentioned with an assumed previous acquaintanceship in the reader. Knowing the hows and whys of the foregoing stories definitely fleshes out the reasoning and the depth of enjoyment for events now unfolding. It is a tricky balancing act: reading a story that is very much part of a sequence could go either way; put off the new reader out of exasperation, or intrigue them sufficiently to seek out the rest of the line. The style of these novellas helps to wing one more in favour of the second option. I think these are books that will primarily appeal to steam-punk aficionados and those who like alternative history scenarios, so their readers should already be of a type clued into the themes and ideas behind them. And the plot structure also helps greatly. With exotic descriptions of alien planets and creatures, and bursts of high-octane action, there is a lot to grab attention. Once the main gist is established: the need to make planet-fall to search out possible deposits of a mineral that could have miraculous healing properties, the action starts when Nathaniel, Annabelle and Arnaud paraglide down. Then they have to conduct their investigations, with a lot of help from a native Venusian guide, while dodging giant killer prawns, riding dragons, finding a hidden tribe of Venusians and facing down a mad surveyor who wants to rule the universe. All in a days’ work, really. And they still don’t manage to find the deposits they were after. To be fair, they did have other things to worry about! The mixing of the outrageous with the just plausible is steam-punk’s special gift. Postulating that steam power and other technologies emerging from there make scientific and exploratory leaps possible in the Victorian era, steam-punk re-imagines an era that was already pregnant with change and possibility. The advances made by human ingenuity seemed to promise a more ‘modern’ and mechanised future, while dragging behind it the positively Medieval reality of slum life for millions across the country. Stripped of this depressing grime, and vaunting the scientific advances being put forward back then, steam-punk is a shiny, vigorous and above all gung-ho genre. And the novellas of Space 1889 are well within this remit, espousing it in slices of highly enjoyable escapism. Nathaniel and Annabelle are having their adventures in space, in the clean, ether-filled distances between planets, and when planet-side, within the tight, excitable timeframe of physical action. They are decidedly middle-class heroes; the clever, thoughtful intellectual and the independent, capable adventuress. Annabelle may be preparing to marry, but one feels that it will not slow her down, especially as she is marrying a (Space) Naval man; himself off and away on actions of his own. The authors here have achieved a fine piece of fun, and a solid continuance to the series. 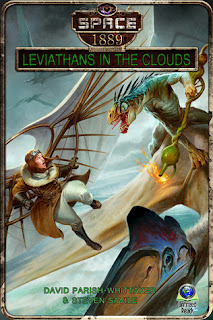 Their steam-punk takes a more ‘natural’ bent, with a book more about natural air power. The heroes use wood frame and cloth sailed paragliders to swoop in on the wind, and later ride giant fire-breathing, winged lizards. Venus is a planet of lush, sweating tropical jungle; parallels between this and the explorations of Africa in that era are obvious, and anchor the action in a sense of realness. The heroes are not super-heroes; they are flawed, self-examining, susceptible to injury, and it is the native guide Thymon who really pulls them out of the fire; the humans (white folk) here needing the strength of the local (the indigenous character) to save them all. There is a canny mix of period sensitivity and modern narrative tropes, and this is when steam-punk works the best; combining these into a recognisable, but still removed, arena. Through this we may choose to examine greater thematics of woman’s lib, colonial grab, greed and prejudice. But why weigh down a fun and intriguing story with overly-layered grandiloquence? Does this book work as steam-punk? Yes, it is true to its genre. Does it work as a story on its own? As a snapshot of a wider space opera, yes. It is neither too non-inclusive, nor bogged down in over-explication. It tickles delightfully, and I defy anyone who likes this genre to read it and not want to see what happens next, or what has happened before. The characters are consistent, and the universe of the series (episodic with carry-over plot threads; a mode that comes naturally from having each story written by different authors, and the whole based on a role-playing game) is preserved. The work of two authors, I was pleased to note that there is little obvious switch within the narrative, stylistically speaking. I have read series one novellas that they wrote independently, and the more sculpted feel of this novella bespeaks a genuine effort by both of them to compliment each other, instead of swinging from one bias to another. The result is a competent and enjoyably vivid slice of the action.